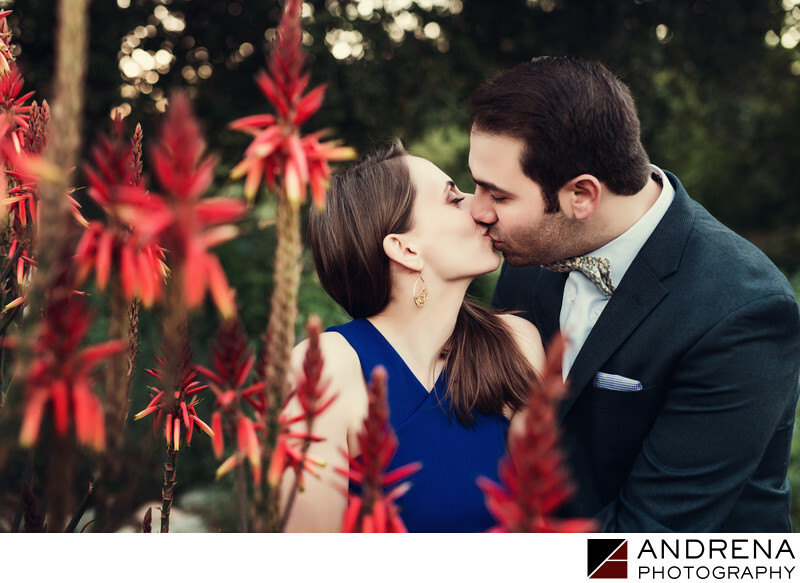 While searching for engagement session locations in Pasadena, I was delighted to stumble across the beautiful Arlington Gardens. This community garden has so many lovely areas to shoot, but it is very crowded with photographers and families on the weekends. I thus recommend that couples who want portraits at this location schedule their shoot on a weekday, as this helps ensure that they can use every part of the garden for their session. The garden includes a small orange grove, but the trees do not always have fruit. So if you want to make use of the orange grove and see beautiful dots of orange, you should research the best time of year for trees to bear fruit. The orange grove itself is also not in optimal light, and in fact, creates a split-lighting situation most of the time. I thus find that the orange grove looks best when the sun dips very low in the sky, or just below the horizon. I always try to save that part of the garden until the very end of your shoot. Location: 275 Arlington Dr, Pasadena, CA 91105.